I just had to do a very grown-up thing and submit a maintenance request. The garbage disposal is making a weird noise. * This isn’t my first maintenance request submission, but it is my first request at this apartment. My first maintenance submission was…well actually it was when my apartment with Casey flooded. That was a tragic night. Very difficult to get through. The less said the better. Anyway. My second maintenance request was in the apartment with Beth and Jenn. The plug in my bathtub locked up on day. After every shower, I would literally have to scoop the water our with a bucket and pour it down the bathtub. I had to call in the maintenance request through the phone. I spoke directly with the maintenance guy. Maintenance Guy: And how high of a priority is it? Kelsey: Um, I guess it’s not a very high priority, I can just continue scooping it out with a bucket. Maintenance Guy: Okay, if you have to scoop the water out with a bucket it’s a high priority. It was fixed the next day. So now, at this apartment, I can submit my maintenance request online. I filled out everything, and then towards the bottom, there was the question “how high of a priority is your maintenance request?” As established above, I am pretty terrible at guessing these things. What was a high priority? What was a low priority? I can’t really use my garbage disposal for fear of making things worse, but, like, no one is going to die because of it. But what if I really needed to use my garbage disposal? Or was the appliance itself the important part of this decision — the stove or the fridge were higher priority than a garbage disposal, for instance. But if I chose “low”, maybe they would put it with the light bulbs and get around to it in a week or so. Then again, they’re pretty good about getting to maintenance requests quickly in this apartment. I’m pretty certain James put in a request for some light bulbs and two days later they were replaced. I chose “low”, but until the disposal is fixed I’ll probably question that decision constantly. *I found a measuring spoon in the garbage disposal. I took it out, but it’s still making a noise. My theory is that the spoon did some damage while it was in there. Or who knows, maybe there’s another spoon in there. I had to think. “Twenty-nine,” I answered, truthfully. He didn’t have a response to that. That answer didn’t satisfy him, and truth be told, it doesn’t satisfy me either. I’ve noticed that different names get different levels of respect. Steve and Thomas in Electrical are both equally respected by fellow associates, by only Thomas gets called Mister. Part of it, maybe, is the rhythm of their names. Mr. Thomas and Mr. Blessing flows off the tongue better than Mr. Steve or Mr. James. Maybe it’s also the Baptist tradition, you know, how Baptists refer to each other as Brother and Sister because we’re all children of Christ or something like that? Or maybe it’s, you know, the slave thing. Most Northerners really encounter such denominations in old books, like Pride and Prejudice. It’s weird that most people only encounter Pride and Prejudice on these things, because the Bennets are shown specifically avoiding that stuff (which is how all the outsiders to Merrifield know that they’re classless hooligans). In Pride and Prejudice, all the daughters are “out” (able to go out in society and meet men). Usually there was a very specific pattern to all this. Take my family. Typically, only one daughter is allowed “out” at a time — the eldest. She is referred to by her last name. 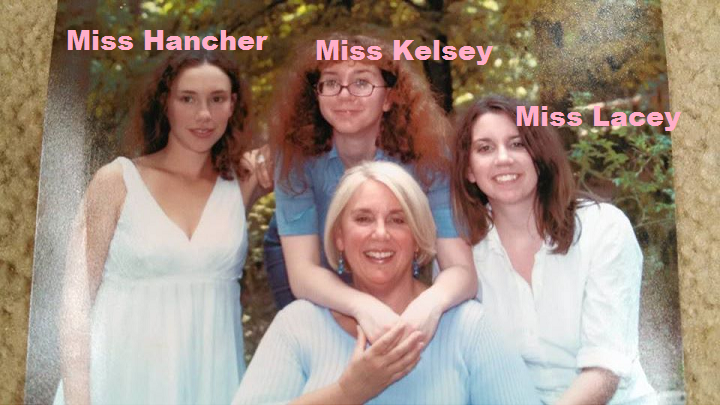 The other daughters, since they are still basically children in the household, are referred to by their given names. 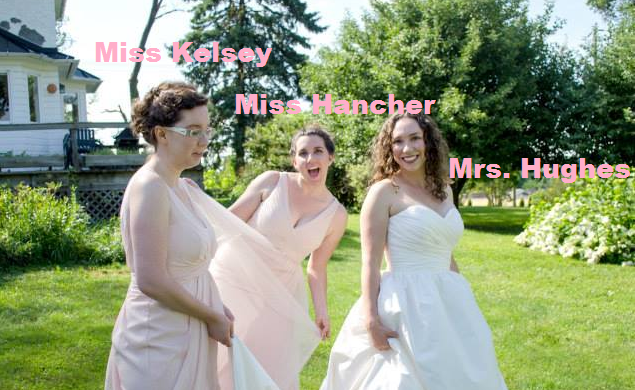 But then the eldest daughter gets married. A highly accomplished half-Jew marries a Roman Catholic, who knew? Anyway, the fact that Lacey and I are twins complicates things a bit. Even though we were born AT THE SAME TIME, I AM STILL CONSIDERED THE YOUNGEST, and have also always been considered sickly. So it’s possible my parents wouldn’t have let me “out”, or perhaps would have had me wait a few extra years. Or perhaps they wouldn’t have, considering that we are only separated by a minute. 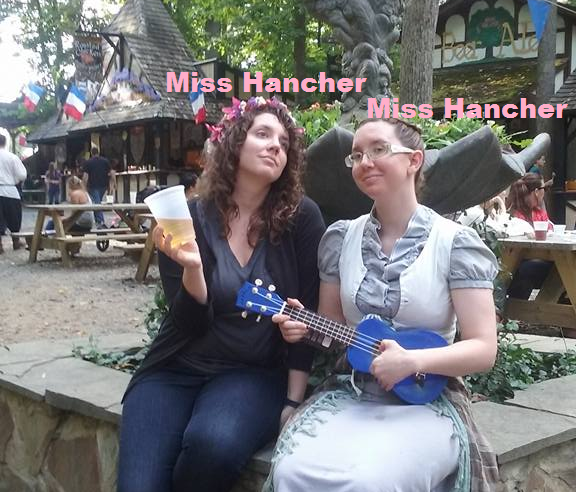 And so I married, leaving just the one Miss Hancher. I’ve spent a lot of time lately looking at wedding photos. I remember this picture. I would always stop at it. It’s a great picture of Deb. She looks so happy. I looked at it and thought, this is the picture that will be shown at her funeral. This morning, I emailed this photo to the funeral director, to be used in her obituary as for identification purposes. There’s another picture — I won’t post it here — the photographers were taking pictures of everyone coming back down the aisle. Lots of pictures of James and I, and a few pictures each of our attendants, followed by my parents. Last but not least was Deb, being pushed by her sister Marcia. Unlike all the other pictures, where she’s smiling and engaged, Deb is shown hunched in her chair, frowning. She looks tired. It cost her so much to get to our wedding. A few days ago, before she had passed, I was at work. I turned to get some paint. All the sudden I thought about that picture, and I had to bend over and just feel for a minute. As the day wore on, I just got more and more tired. I didn’t really want to listen to anyone. I remember talking to Harold, Marcia’s husband. “I met Debbie when she was a two-year-old curly blonde girl who just wanted everyone to pick her up,” he told me. 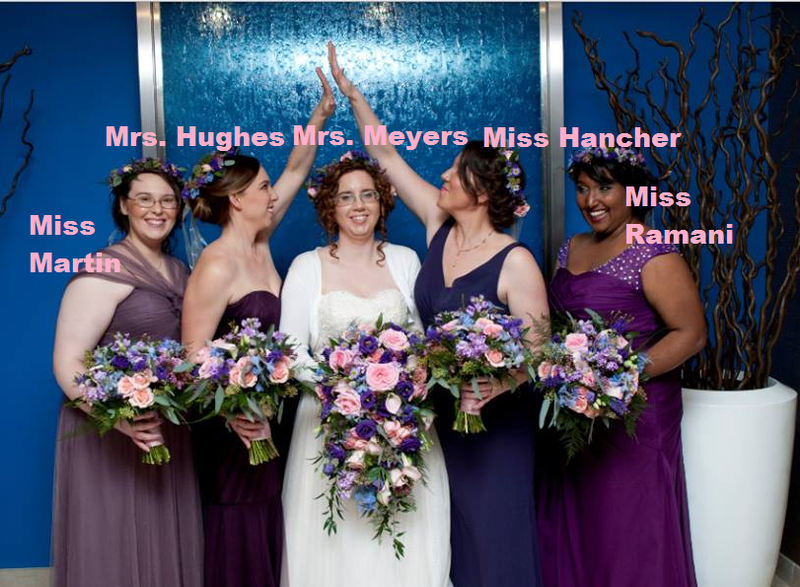 “She was the flower girl at our wedding. We had to put off our wedding for three weeks because Juanita told me that she was giving birth — she was having Lynette.” Then he started talking about how they had hardly any time for themselves because seven siblings and their children and grandchildren meant constant birthdays and holidays, and then Marcia made him stop talking so I could leave. With no living spouse and only the one kid, Deb really only has one heir, and that’s James. Today we walked all throughout her house and started touching on what we would want to keep and what we wouldn’t. The beds, the furniture in the sun room, the breadmaker, the dim sum set. “She’s still decorated for Christmas,” said James. “I like these little ceramic houses,” I said. James and I picked them up and examined them. James pointed out that they were limited edition collector pieces from England. “They good Christmas decorations,” I said. “We can get rid of these leather-bound books,” said James. “What about these Drumel figurines?” James asked me. I stopped and flipped through family photos whenever possible. I only met his dad the one time; the next time I saw him, he was in the hospital, heavily sedated, on the verge of death. I tried to find some semblance of knowing this family. I looked at the pictures of James’ parents together. There was one of them with the same haircut and plaid shirt on. James laughed at it. I studied the way they looked at each other. I remembered standing with Deb over his dying body. I had asked how they met. They had met in college, through mutual friends. When he said that they weren’t going to see each other for a while, Deb assumed she was being dumped, and returned all of his things. When he found all of his things on the porch, he had broken down into tears. That’s how his mother knew Deb was special. They got together a few months later. They were together for nearly forty years. “I think if the roles had been switched, Dad would have ignored her living will and fought to keep her alive,” James said. I found the pictures of them cutting the cake. I remembered cutting our cake cutting experience. I had never cut a tiered cake before. I had never really thought about how to cut into one, or how small you were supposed to cut the pieces to feed to each other. “Just finish it up,” I remember someone hissing at me (or perhaps that had been my imagination). James had been perfect, laughing all throughout and being silly, stealing frosting and kissing me after we had fed each other. There was no sign of that awkwardness with the two of them. They were laughing. Deb had that face. She had that way of holding her face when she laughed. Across from us in the room, there were family photos hanging on the wall. One was a wedding photo, but the other two were of James. Toddler James, grinning for the camera. One by himself, one with his grandmother. I remembered the second time I met Deb. She had come down to visit James in his apartment. I walked in to see her cleaning the baseboards. Whenever I clean baseboards, I think of her. After visiting, I had to leave for class. I picked up my book-laded backpack and prepared to go.